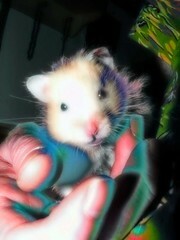 Pocket was the smartest hampster I ever had. He communicated with squeaks every day and was loud enough to be heard from other rooms in the house. He squeaked usually when he was angry, which was often, but he also squeaked when he was playing or when he wanted attention. Pocket would chirp from his bed when he wanted to sleep outside of his nest on the human bed or where ever. He would scream if someone tried to pick him up when he was eating or tried to play with him when he was working. He would bark when he wanted to come out of his pen and run free, either with or without his hampster ball. He always tried to look people in the eyes, which was different from a lot of other hampsters that I had who seemed disinterested in the business of humans. Pocket looked up out his pen, looked through the glass of his tank, and faced the direction of people when he was out in the open. These past two years Pocket has been the constant companion of Lee because Lee has been injured and cannot move very well. Lee is in bed more than not, and Pocket would nap with him either in his hands, against his neck, or tucked against him somewhere. If he needed to go to his hampster potty he would poke Lee with his nose and Lee would take him there; sometimes he would indicate afterward that he wanted to nap more but other times he would start doing hampster work. Despite having long fur Pocket took the time to keep himself clean whenever he was not playing with Lee. Sometimes Lee needed to play so much that Pocket would get behind schedule, but that just shows hampsters can set priorities. In the last month Pocket had trouble grooming himself and we had to bath him almost every day because his fur was dirty. He took well to being washed and bundled himself rather than running around when we wrapped him in swaddling cloths afterward. His hair was not styled the way he did it after we brushed him, but it was at least clean and fresh. Pocket had wet tail, a common hampster ailment, for nearly three weeks before he died. We had to clean up after him in this time, which must have bothered such a clean and independent animal. He simply did not have the energy on his own. We took Pocket to the vet on Saturday September 1. The vet noticed that Pocket was fat and that his walking was staggered. He also said that his heart rate was increased, which I noticed before but never talked about with Lee. He said that Pocket had Cushing’s disease and could be treated with human drugs for about $80 a year. The vet visit cost about $100, which was a problem considering that I am unemployed right now. It is sad that a person should have to worry about money in times of medical crisis; it really makes the mood much worse. Pocket’s appetite never wavered and I fed and watered him as we came and left. We went to an emergency clinic in Burian, which is far from home. Lee grew up in Burian, and as his home was just a few blocks away, he wanted to show me some of the places he told me about (his paper route, church, school). He drove by his home and said hello to a neighbor doing yardwork. Lee asked about his father. They had an argument a long time ago and Lee wanted to make peace that day; they had not talked for more than ten years. The neighbor told him that his father died of a heart attack about a year ago. Lee went to his house and talked to his mother and his sister Sharon, who happened to be visiting. Lee told me that he wanted to find Sharon and I am glad they met. His mother is addled as he said. She had genteel conversation with me about gardening, animal welfare, environmental activism, socializing while traveling, and British mannerisms. It was superficial and not in accord with the situation of meeting her son after decades of estrangement, but she was proficient in smalltalk. Lee talked to his sister while I entertained his mother as a conversational counterpart. She said she wants to get back in touch with Lee and I hope she does. Both of them were sympathetic to the hampster. We went home and Lee lay with the hampster. The next day, today September 2, Lee was holding the hampster. He put him in his pen to get water and snacks while he (Lee) went to the bathroom. When Lee returned Pocket was dead. I buried him in the backyard. I was very sad but Lee was horrible. Lee pets that hampster whenever he is in pain and his physical and mental condition was wretched. We are planning to move from Bellevue to University District sometime in the next couple of months so we decided to forbear the getting of a new pet just yet. I tried to make the title of this thread “rest in Pocket,” because that’s what Lee did. Requiescat in pacem, Pocket.